Each day a different blogger will host a themed linky party and there will be lots of giveaways. The fun starts now at Debbiedoo’s Blogging & Blabbing with the theme Holiday Copycat. have to check back each day of the party as I reveal more. 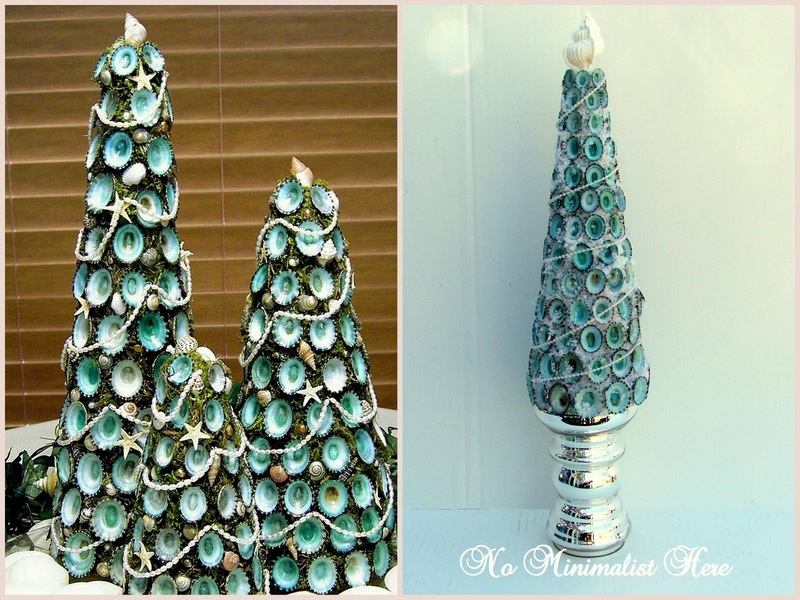 I saw the picture of this shell tree and I instantly knew this would be my Copycat project. were applied with hot glue, starting with the larger shells on the bottom and working up. decorations in our dining room. Please visit Debbiedoo’s Blogging & Blabbing to see all the copycat decor. I will be hosting HOLIDAY DINING beginning the evening of 12/7 and there will be a great GIVEAWAY starting then. Get those tablescapes, dining room vignettes and recipes ready to share at the party. Any type of Christmas decorating in the dining room is welcome. *The Holiday Dining linky party will be held in lieu of the Open House party for that week. I hope to see you there and please check out below the other parties starting this week. Wowie, kazow! What a fab redo! This is so pretty, Sherry! 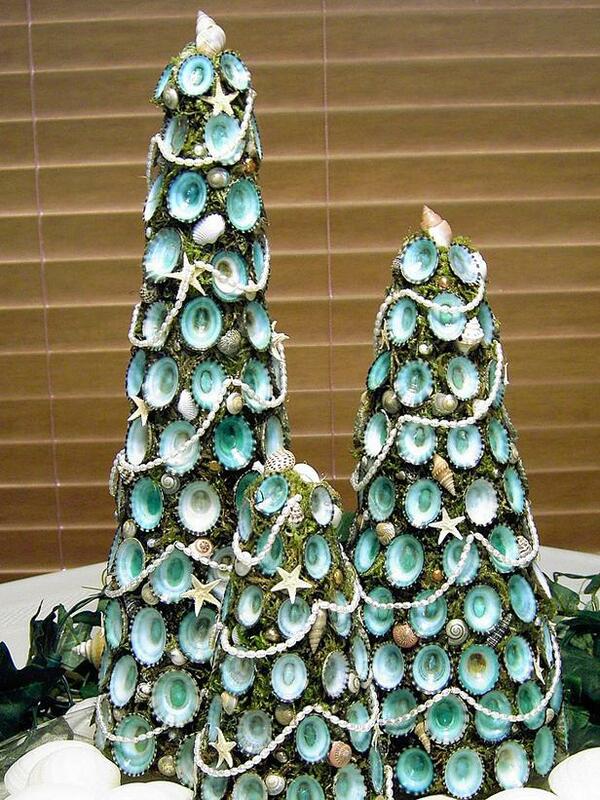 What a great tree to have if you love coastal or beachy decor or are lucky enough to live by the water. 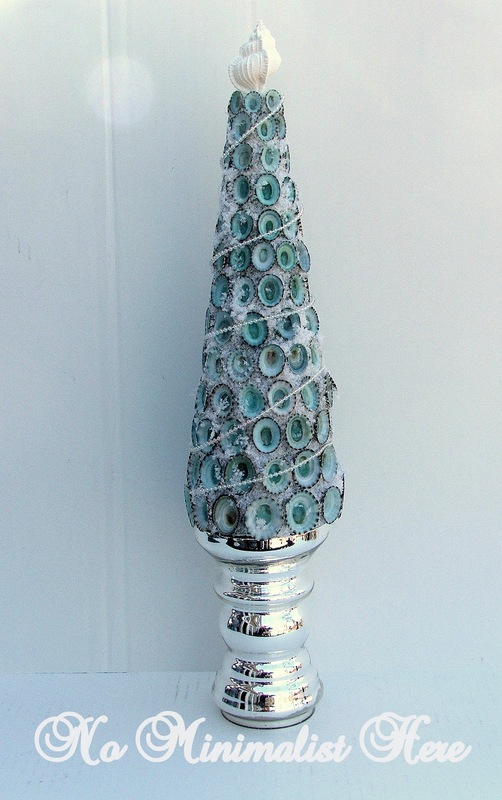 Love the blue in these shells, too. Great copycat! Sherry, this is just gorgeous! What a great copy! I actually like yours better on the silver base! Very elegant! Can't wait to see the rest of your decor. I know it's fabulous! Um…I seriously LOVE yours more than the original!! It's gorgeous Sherry..I am jealous. I just love the blue and silver together. Fabulous and unique copycat! Can't wait for the fun week ahead! No way, look out BH&G, there's a new kid in town. Just gorgeous Sherry, you did an amazing job. I am so happy you joined in the fun! So elegant, and beautiful. I am swooning over such a simple piece. You sure have a gorgeous tree, I have never seen anything like it before. It is just beautiful Sherry, I like yours better.I think the snow is much prettier than the moss. Very pretty and elegant. At first I thought it was bottle caps! I don't think I have seen trees like this before. Oh my goodness, it's beautiful! Love it! Great job Sherry! Love it! Well done Sherry! I really am impressed! I have never seen those shells before. The colors are gorgeous and I like your version much better. Sherry it turned out very pretty! Please Come and enter in Our Twelve Days of Holiday Giveaways. There are so many exciting & special Gifts! Tis the Season! What a cute idea and yours turned out adorable. Your shell tree is just beautiful! I can't wait to see where you are going to put it. You are original and brilliant. This is so pretty, Sherry! I actually like your copy better than the original. You copy cat is beautiful, Sherry! It's so unique and elegant! Ooh I love it Sherry!! Sherry, yours wins, hands down! Wow! I've never seen a tree like that. That is so unique. You did a great job on your version. They need to take lessons from you, Sherry, because your's is sooo much prettier! Can't wait to see the rest of your decor. Wow!!! You did an amazing copy cat…beautiful! WOW. WOW. WOW! Your tree is simply stunning…. This is beautiful! The colors caught my eye right away! I am visiting from Debbiedoos! Nice job! OMGoodness, Debra! You wi the prize for the most elegant copy cat!!! Your tree is gorgeous! I want one. That is absolutely stunning! Love that base too. Beautiful! Wow…just lovely…such a pretty color, too!